Christmas is a joyfully time in the lives of all Christians; the birth of Jesus, meeting with friends and family and sometimes even traveling to visit with relatives. Through all this fun and Christmas cheer, you always end up with a couple of gift cards. This always leads to the dilemma, what to buy with the $100 of Best Buy bucks you have. I ended up purchasing the Punisher from the local Best Buy retailer. First things first, just the ability to play as Frank Castle himself gives the game a few points. I know this sounds fanboyish, but hey if the main character is likeable (in his own...way)it deserves the points. 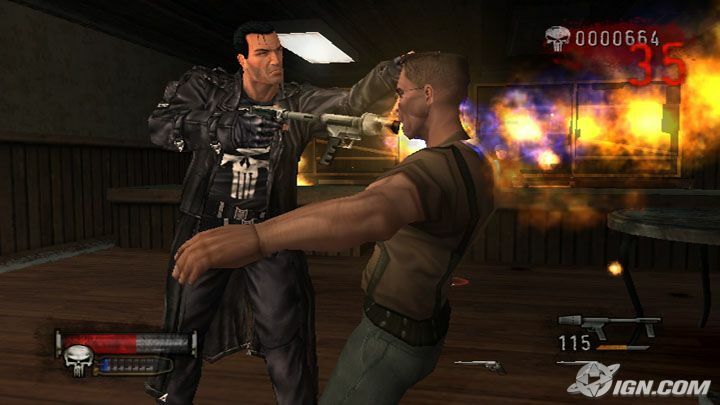 Once I put the disc inside of by beloved Xbox, I was pleasantly surprised at the quality of the game, in my humble opinion, The Punisher is one of the best comic book games ever made. If you are considering playing this game, chances are you have read a Punisher comic or seen the recent film adaptation (on a side note, I like the movie and would recommended, especial now since its on DVD). A FBI agent named Frank Castle is having a family reunion when a bunch of mercenaries come to extract revenge on Castle. This leads to all of Frank\'s family getting murdered and Frank barely surviving. His hatred for criminals leads him to become the world\'s most known vigilante, the Punisher! The opening cut scene will have your lower jaw hanging, its easily one of the best rendered FMV I have ever seen. After the cut scenes over, your jaw will firm return to place as you realize the in-game graphics are barely above average. The game boasts the Havok engine, which leads to some nice rag doll physics, which add a lot during an intense gunfight. Characters sport a cartoony look with out going over board, no cell shading in the gritty world of punishment I guess. The Graphics get a B; Solid but nothing revolutionary. I\'m starting to see a pattern in my reviews, most games have either amazing sound or awful audio elements, The Punisher falls marginally into the first category. The Punisher is voiced by Thomas Jane, the same actor who played the character in the movie. Overall, the soundtrack is repetitive but the voiceovers are at time funny and sometime useful. The sound department receives a B, just like the graphics, solid but not worth praise. The controls are similar to ever other shooter on the market, you shoot with the right trigger and throw grenades with the left. The Punisher\'s biggest flaw, control wise, is the lack of a jump button, which is interesting. The hulking Punisher can literally rip peoples heads off, but he can\'t jump vertically. The game play is also run of the mill with one ace up it sleeves, interrogations. The interrogation are worth a rental alone, as you sneak up behind a person, you can try to make them talk and reveal secrets like hidden gun stashes and access codes. They way you control the interrogations is also fun, you move the right thumb stick and depending how hard you move it in one direction determines the strength of the blow and how much more will cause them to squeal. The game play and controls gets a B, ditto. Violence: Graphic and messy, but can be disabled. Language-rated language with tons of F words and other words. Drug content: Many references including a playable level in a crack house. I do enjoy the Punisher, primary because of its title character, which the game does justice. At the end of the day, The Punisher is a large above average but forgettable entry in Marvel Comic game history.